I am split on my next Cadillac update. The choices are to replace the mufflers with performance, high flow mufflers, or to begin to experiment with intercooler cooling system improvements. For the exhaust I am settled on replacing the stock, low-noise mufflers with Magnaflow 14326 mufflers. The exhaust system itself is stainless steel, and appears to already be bent properly. The cost should be around $100 ea x2 for the hardware, plus installation. I suspect it will free up 10-15 whp. The intercooler system uses Laminova tubes with a small heat exchanger in front of the car. I plan to add a 2nd front mounted heat exchanger in serial with the stock heat exchanger. The original LC3 testing was done assuming harsh heat conditions with high intercooler coolant temps. Later when required to SAE certify, the engineers also needed to reduce the temperature for the intercooler coolant; the engine famously went from 440hp with the original assumptions to 469 hp with the cooler assumptions. So I suspect that anything we can do to reduce the temperature of the intercooler coolant is worthwhile in terms of more hp. Technically, reducing the intercooler air temp does not add more oxygen to the air, since at that point the mass of air coming into the system out of the supercharger is fixed. However, what cooler air across the intercooler does do is allow the LC3 engine to run more timing, which it will do automatically, and achieve more power. Reducing the temperature of the intercooler coolant is one way to achieve cooler intercooler exhaust (IAT2). Another thumbrule I have read is that Laminova heat exchangers operate best if the area of the heat exchanger is equal to the area of the coolers. I had to think about that a bit to understand what was meant. For the Cadillac the area of the Laminova coolers would be 96 square inches. The area of the stock heat exhanger would be 21×14=294 square inches, which would appear to meet the thumbrule. It is inviting to do something really revolutionary like put an intercooler reservoir in the spare tire compartment and run hoses the length of the Cadillac, but probably better to stay conservative for a daily driver. I am happy with my Ambient / IAT / IAT2 measurement capability. I would like to have a direct measure of intercooler coolant temp before the next changes, but I am unsure how best to achieve and log that. Taking an export from my HP Tuners datalog, I have been doing a bit more data analysis of various parameters. Perhaps I am doing something wrong, but there appears to be a ‘hiccup’ in the csv export of the HP Tuners, in that the RPM is exported to the comma delimited file with a comma-formatted value. For example, 2450 rpm is exported as 2,450 rpm so when imported as a comma delimited value it gets split into 2 and 450. So, once I manually fixed that in my target file then I could import the data and begin to make some charts. These charts show RPM across speed 0-60 mph, along with Boost at the same speeds. RPM is shown on the left Y axis, and Boost PSI on the right Y axis. Speed in MPH is along the X axis. Boost is certainly spikey measured this way. There may also be other factors involved. The Boost PSI is calculated by comparing the Manifold Absolute Pressure (MAP) with the V’s Barometric calculation (Baro). One can see that the V does not shift at exactly the same RPM at 1-2 and at 2-3 although I believe they are both specified to shift at 6500 RPM. This is the same graph with some smoothing done by averaging of values, 2 prior to and 2 after each point. My conclusion is that boost is in fact higher in 2nd gear than 1st gear. This is perhaps due to more air flow into the intake at speed? I am not certain. On the graph Boost appears to settle around 9 PSI at high RPMs. Boost in this dataset peaks at 9.86 PSI which in the smoothed set is 9.43 PSI. The STS-V was designed for 12 PSI of boost. If we assume the supercharger makes 12 PSI of boost then this reading after the Laminova tube intercooler suggests that the pressure drop of air across the intercooler is 2.57-2.14 PSI. Although the info shown is relevant for 4 Laminova cores in series, the Cadillac design does not have 4 in series but rather has A-B in parallel and C-D in parallel flow. I caused some confusion in the way I asked my question of Laminova as it turns out. I am leaving this for consideration, but the pressure head through 2 Laminova cores instead of through 4 cores would be different. 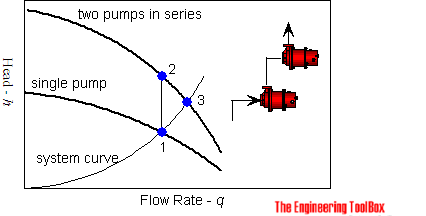 In my analysis of pump flow rates versus the intercooler pressure head it became clear that at higher flow rates the stock pump has restricted flow. In fact, instead of flowing 8 gallons per minute (gpm) it is probably flowing under 4 gpm. We could find a new source for a intercooler coolant pump that can flow 9 gpm against a 1.4 bar resistance; that would be ideal. However, there is a way to work with the parts we have to overcome this hurdle. Note that I don’t have a sophisticated model of the overall flow resistance, but that my conjecture is that the flow across the heat exchanger is around a 1 psi resistance, and that system resistance for the hoses etc is 0.4 psi. In my modeling a second front mounted heat exchanger is shown as another 1 psi of resistance. For our previous graphing this basically means if you put two pumps in series you ‘stack’ the two pumps’ flow versus pressure diagram on top of each other. Using this insight, one way to overcome the pressure head presented by our intercooler system with the parts we know is to put 2 of the stock Bosch pumps in series in the flow. If that works well, how would 2 of the Jabsco Cyclone 50840-12 pumps work? Hmm, what if we put THREE Bosch pumps in series? What about the Cyclones? Lots of complication, but let’s look at it. First, the light green line bottom left is the stock intercooler pump flow. Bottom left orange line is one cyclone pump. See the light blue line that flows down from 1 bar and matches and doubles the green line flow line from one pump? That is the line for 2 stock intercooler pumps in series. The darker green line that runs down from 1.2 bar is for two Cyclone pumps in series. What about 3 pumps? The purple line running down from 1.5 bar is 3 stock pumps in series. The yellow-green line running down from 1.8 bar is for 3 cyclone pumps in series. This tells us that the flow rate through the system with 1 stock pump of 3.4 gpm goes up to 5.2 gpm if you add another pump, or 6.0 gpm with 3. The system flow rate of a Cyclone goes from 4.7 gpm alone to 7.1 gpm with 2 or 8.9 gpm with 3. Is more flow always better? Well, yes, up to a point. On the flow diagram I have summarized the heat transfer for each combination with the circles with letters in them. 1B= one Bosch, 1C= one Cyclone, 2B= two Bosch, 2C=two Cyclone, 3B=3 Bosch, 3C= 3 Cyclone pumps in series on the line at the top of the flow diagram. That line they are all on is the heat transfer graph for the Laminova cores; it uses the right axis for its values, which are in kilowatts of heat transfer. In the table I have read off the approximate values from the graph. What we see is that 2 Bosch (2B) pumps give us a 15% improvement in heat transfer, and 2 Cyclone pumps (2C) give a 24% improvement. Going to 3 pumps does improve it further but to a reduced degree. Adding 1 Bosch pump to the stock pump adds 15%; adding a 3rd only adds 6% more. Replacing the stock pump with 2 Cyclone pumps adds 24%; adding a 3rd Cyclone pump only adds 6% more. My conclusion is that an optimal mix of expense versus reliability and complexity is to add a 2nd Bosch or replace the stock pump with 2 Cyclone pumps in series. That should give us the best bang for the buck improvement in flow and heat transfer relative to expense. What is the safe pressure for the intercooler cooling system on the STS-V? What PSI is the relief/overflow cap set for? If it is set for 5 psi (0.3 bar) can the system function above that? Response: Because of the pressure drop across the Laminova cores at high flow rates there is a high pressure side of the system from the pump to the cores, and a low pressure side from the Laminova cores through the heat exchanger and the refill/pressure relief back to the pump. The 5 psi relief won’t trigger unless the pressure in the system at THAT point is above 5 psi. I like the additional front mounted intercooler idea. It seems a good way to add system coolant capacity and some additional cooling. Additional coolant capacity acts as a delaying function for changes in coolant temperature. Each of the Jabsco Cyclone pumps runs around $210; so 2 for $420. The front-mounted heat exchanger (FMHE) for under the bumper I have in mind is $179. It would take 5 hours of labor or so to remove and replace the front clip to install ($400). So for a total budget of $1,200 or so the overall intercooler cooling system could be 24% more effective. If you do the work yourself parts alone would be $600.